Directions (1 – 4): Study the following table chart carefully and answer the questions given beside. The above mentioned table shows the time taken by the different pipes to fill the given tanks. 1. A and B working together can fill the tank X, if A is working with half of its efficiency while B is working with double of its efficiency. Find the time in which B can fill the tank X working individually? 2. What is the capacity of the tank X if B fills 380 litres in a minute and the time taken by B to fill the tank X is to be taken from the previous question? 3. New tank P which has capacity equivalent to tank X and tank Z together. Pipe C fills tank Z at the rate of 200 litres in a minute. 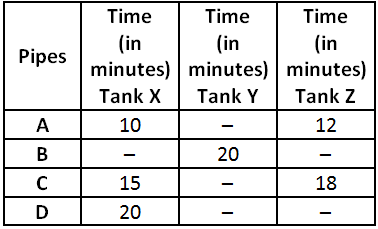 Now if D fills tank P at the rate of 110 litres in a minute working individually, find the time required by D to fill the tank P. The data regarding the capacity of tank X is to be taken from the previous question. 4. If pipe A is opened for 3 minutes, pipe B is opened for 4 minutes, while pipe C fills the remaining part of tank Z in 9 minutes 54 seconds. Then how much time will B take to fill the tank Z working individually? 5. Four trucks are hired at the rate of Rs. 6/km plus the cost of diesel at Rs. 40/L. In this context, consider the details given in the following table. Which truck maintained the maximum average speed? 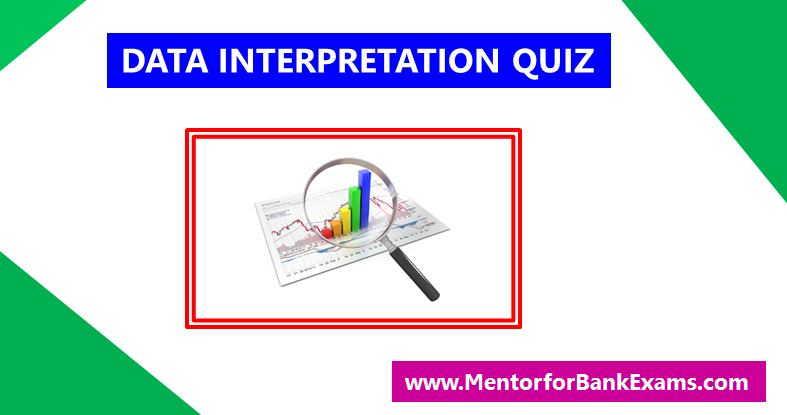 Directions (6 – 10): Study the pie charts carefully and answer the questions given beside. 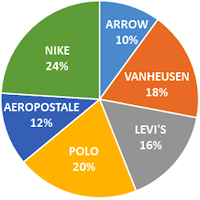 Below pie chart shows percentage breakup of production of men’s clothing items from various brands during 2017. Note: All the given brands produce Jeans, Shirts, T-shirts and Trousers only. Below pie chart shows percentage breakup of production of Jeans during 2017. 6. If during 2016, NIKE produced 10% more Jeans compared to what it produced in 2017, and also the overall decrease in production of NIKE is 15%, then what is the total number of shirts produced by NIKE during 2016? Given that T-shirts produced are twice the number of Trousers and Shirts are 100% more than Trousers during 2016. 7. Number of Jeans produced from Levi’s is approximately what percentage of total men’s clothing items produced by Levi’s during the year? 8. If 40% of Men’s clothing items from POLO are Trousers and the remaining are T-shirts and Shirts which are in the ratio of 7:9 respectively, then what percentage of men’s clothing items produced by POLO are Shirts? 9. 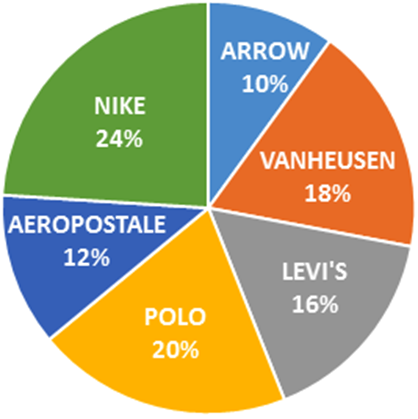 What is the average of differences (in thousands) between the number of total men’s clothing items of Arrow, Levi’s, Aeropostale and that of Vanheusen, Polo, Nike? 10. 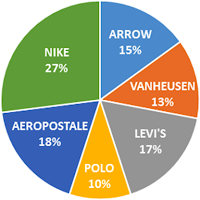 If the ratio of cost price to marked price of a Jeans from ARROW is 2:3, and a total of 60% of the produced Jeans from ARROW are sold. What is the total selling price of all Jeans sold from ARROW, if each is sold at a profit of Rs 1200 after giving a discount of 20%? 1. B) We know that efficiency of a pipe is inverse of the time required to fill the tank. Thus the capacity of tank X is 800 liters. Clearly, SA has the highest value. Let number of Trousers produced be X. Let cost price be 2Y and Marked price be 3Y.